So how can I possibly be bored with mums? Well, to start with – they’re everywhere! Can’t we just limit their availability to fall? Cool nights, changing leaves, apple cider and candy corn? And maybe we could jazz them up a bit. While the little balls of fabulous fall color are spectacular on their own, they are a bit – round. No reason not to use them, just maybe an excuse to go from boring singular mum to awesomely mixed containers! Ornamental Peppers, Millet, and Mums – OH MY!! 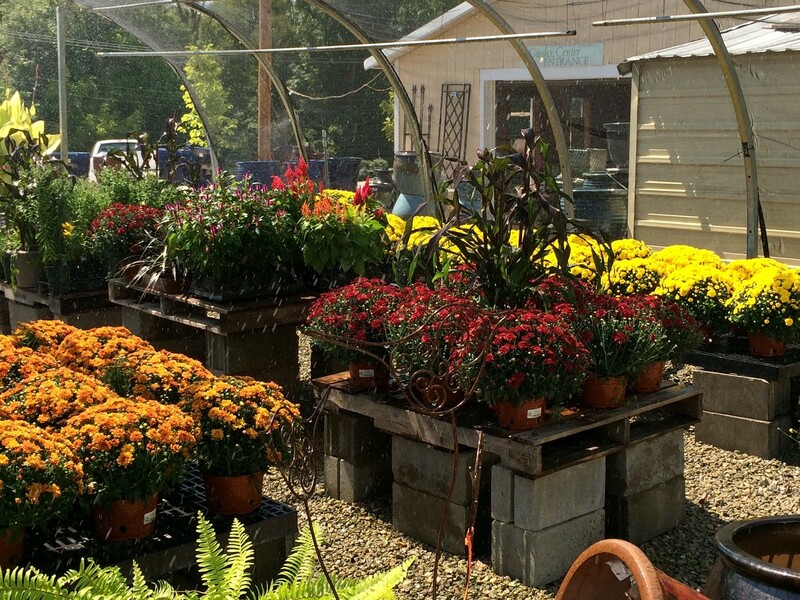 Aannnd – there’s so much more to plant in the fall than just mums. I get that a mum is the seasons ‘it’ flower. 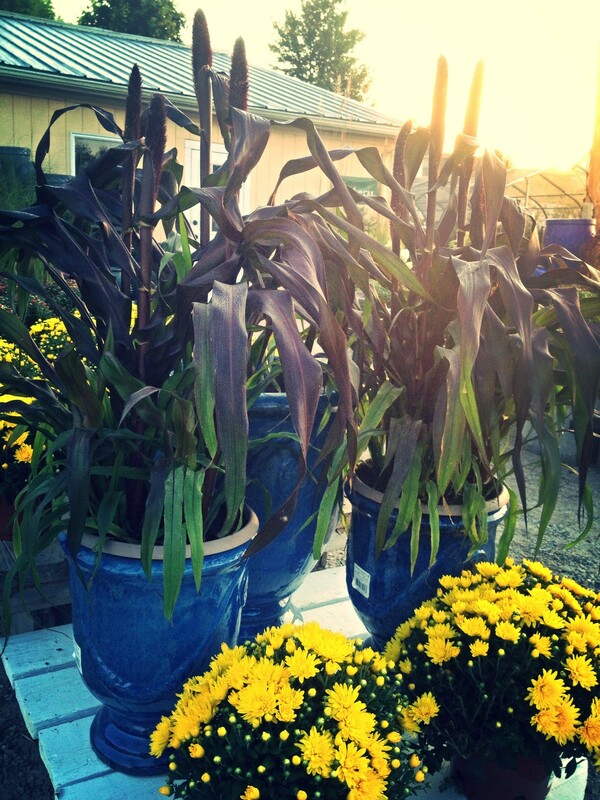 But, did we forget that there are other, equally wonderful, plants for fall containers? 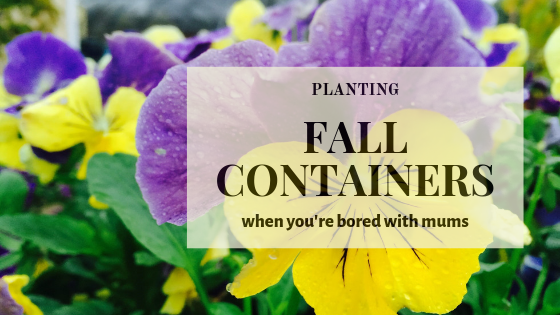 Well, I’m here to remind you that there are other options for your fall containers than just a simple, boring mum. 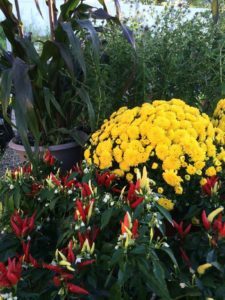 Now that your summer annuals have called it kaput, it’s time to give THESE plants a chance this fall! This showy annual is quite possibly my favorite annual to use in fall containers. The spiky blooms display brilliant color while their ability to tolerate cooler temperatures makes them long lasting. 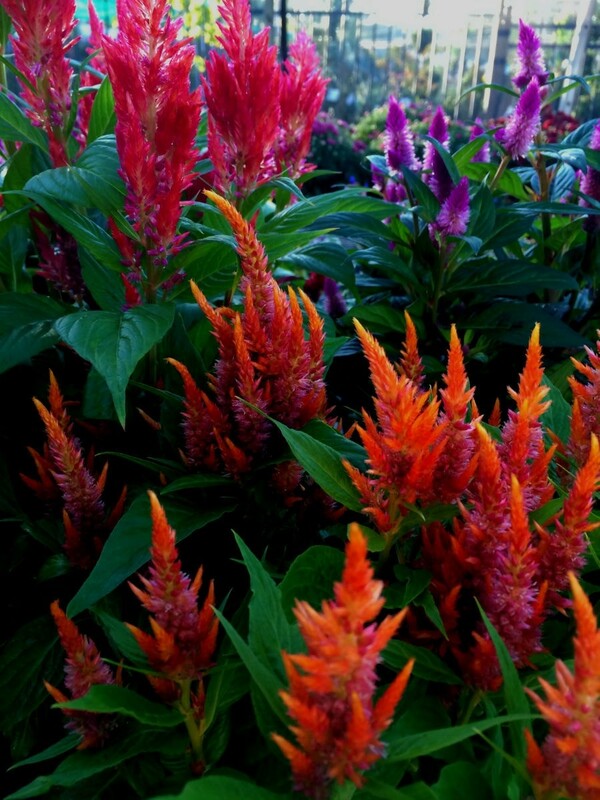 The colors of Celosia are spectacular for fall! 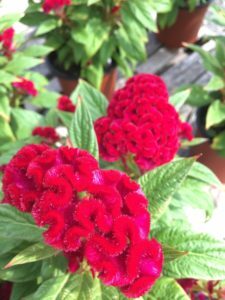 This easy to grow annual prefer sun and somewhat dry soil. Be sure not to over-water!! It’s also a great plant to help get kids in the garden. With Halloween right around the corner, what kid wouldn’t love COCKSCOMB BRAINS!! Use plants with interesting texture to get kids involved in gardening! Also known as Celosia argentea var. cristata – you know, so the garden center staff doesn’t look at you like you’re crazy when you ask for brains. 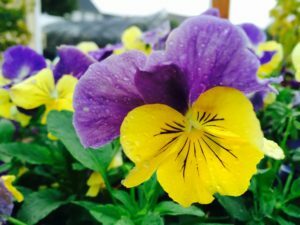 The bright and cheerful faces of pansies make great additions to fall containers. The large array of colors available make it the perfect accent for any color combination. Pansies make a cheerful addition to fall containers. Pansies are not to be outdone by other cool season annuals though. Their cold tolerance allows this annual to be one of the longest lasting fall annuals – sometimes making it through the winter and into the spring! Looking for a bit more bang for your buck? Put perennials in your containers. Once the season is over, they can be planted in the ground and enjoyed for many years to come! 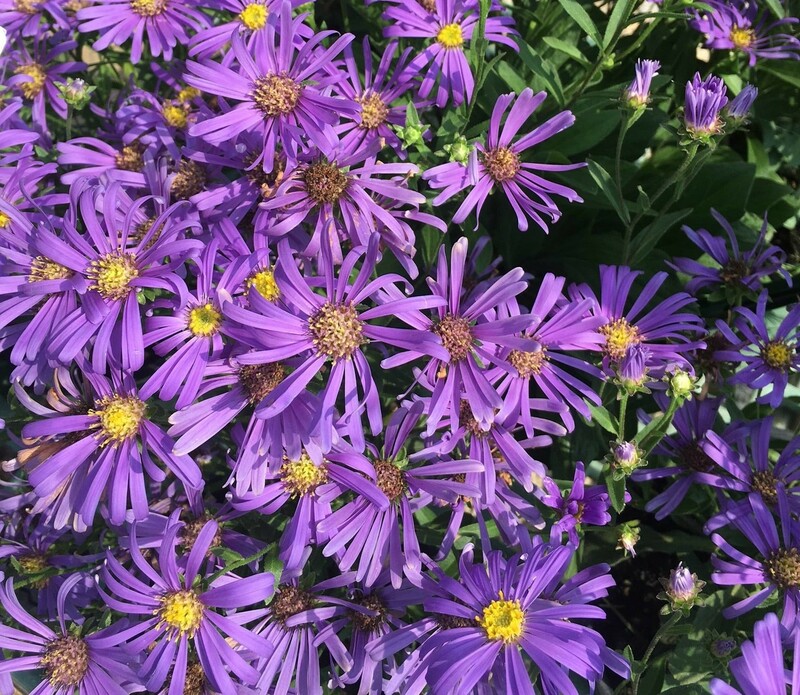 Enjoy amazing amounts of color from fall flowering perennials like this Aster. Fall flowering perennials, like Asters, offer shocking amounts of color at bloom time. Sedum is another great fall perennial that offers deep colored flowers as well as offer and interesting foliage in texture and color. 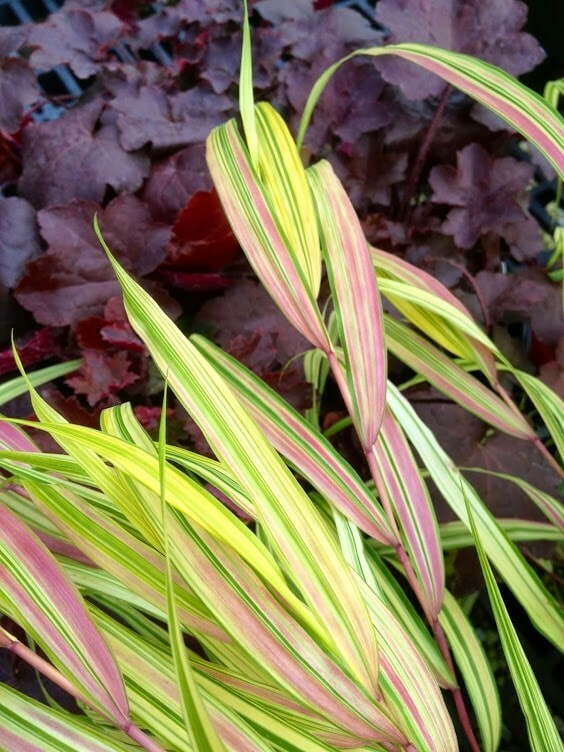 A favorite perennial combo of mine is Palace Purple Coralbell and Aureola Hakonechloa. The difference in texture and color contrast make for a truly wonderful arrangement. The Coralbell holds its color but the Hakonechloa ages to a deep burgundy-wine. Winner! I just can’t get enough of Millet! This fall I planted Millet in my urns. That’s it – nothing else – just Millet. And it’s gorgeous!! Elegant Millet is stunning on its own or in mixed containers. Rich, burgundy-red foliage and large plumes offer a statement that few other varieties of grass can achieve. The strong stature of Millet allow this annual to stand alone in a container or create a centerpiece to other fall flowers. Containers don’t always have to be about flowers to be beautiful. No, really. They don’t. If you’ve ever grown Ornamental Kale or Ornamental Peppers, then you’re already on your way to growing vegetables in your containers. Most Kale and Pepper varieties you find in the fall aren’t grown for eating, but the color intensifies as the season becomes cooler creating a gorgeous late season display. 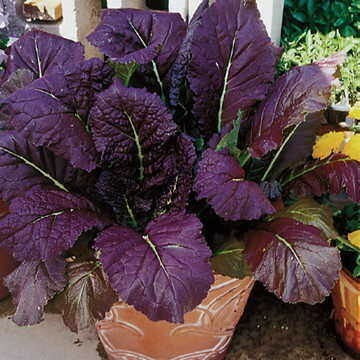 The foliage of Red Mustard makes an excellent accent plant in fall containers. Two plants that look spectacular in a fall container but can also make their way to your dinner table are Swiss Chard and Red Mustard. 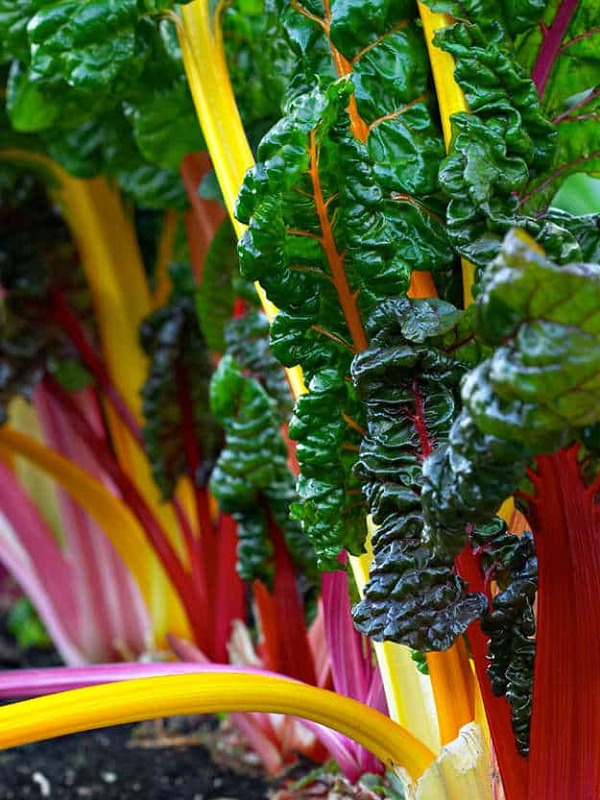 Burgundy-red leaves of Red Mustard offer a warm taste of fall while the brilliant stems of Swiss Chard add a rainbow of color to fall planters. Not quite ready to try these on their own? Not a problem! 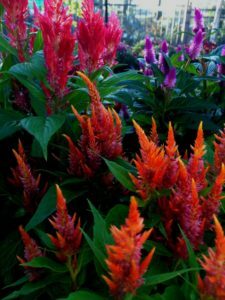 They would look spectacular with Celosia, Pansies, and (gasp!) even Mums! Ever wonder why you plant mums but they seldom come back the following year? Find out HERE ! !